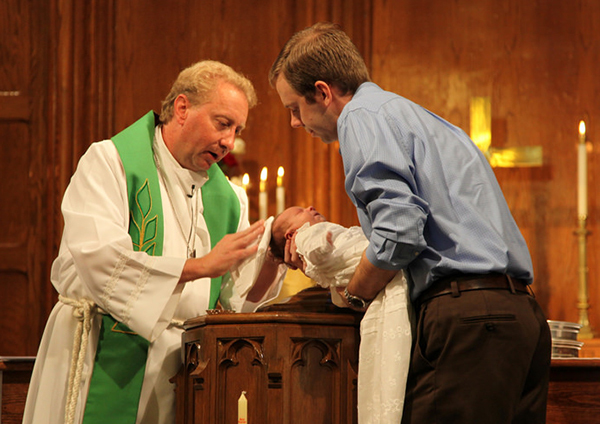 Tulip’s Baptism: Is It Valid? I really can’t get enough of the show Preacher. I find myself drawn back to it like a moth to a flame. The Quentin Tarantino-esque violence and captions, the Simpsonian lampooning of American Christian culture, the witty back and forth between Cassidy and Jesse, soul searching with Arseface, the whole thing has me intrigued. No, it’s not exactly a “Christian” show, but it treats theological topics better than “7th Heaven” could have ever dreamed. In the second episode, “See,” Jesse Custer is busy trying to rebuild his father’s once vibrant congregation. It is perhaps a plight with which many a pastor can identify. He even spends his day outside the local supermarket asking for suggestions for improvement. I’m not sure how effective that would be in reality—perhaps it’s more effective than doing nothing. However, the one thing he does that is truly worthwhile is baptizes Tulip and Arseface along with a few others. It is worthwhile because Jesus Christ gave baptism to His disciples as a means for making disciples after He had suffered under Pontius Pilate, was crucified died and buried and rose again on the third day. He gave it to them then because it was into these events that we are baptized as Christians. (Rom 6:4) There were of course baptisms before His resurrection, but those baptisms, including that of John the Baptist, were necessarily of a different character than the baptism Jesus gave His disciples shortly before His ascension to the right hand of the Father. (Matt 28:19) In order for Jesus to baptize us into His death and resurrection, He first had to die and rise again. Only then would He attach salvation to baptism saying, “Whoever believes and is baptized will be saved.” (Mark 16:16) So we Christians put a lot of weight on baptism recognizing it with Paul as a blessed washing of regeneration and renewal by the Holy Spirit. (Titus 3:8) Baptism quite literally works wonders. “Nothing now, that baptism thing worked wonders,” Tulip answers sarcastically when Jesse asks her “What is wrong with you?” Tulip had stolen Jesse’s steering wheel, tied it to the top of a streetlight and accused Jesus of taking his wheel. In reality it seems as if her baptism had changed nothing. Perhaps this isn’t surprising given the seriousness with which she was baptized in the first place. Tulip shows up to the baptismal service, dressed to seduce, asking “Save me, Father.” in a sultry voice meant to grab Jesse’s attention. After he somewhat reluctantly baptizes her she thanks him for “getting her all wet.” One can hardly think of a more flippant way to respond to baptism than with a double entendre. It stands in stark contrast to the joy of Arseface who leaps from the baptismal stock tank like a calf leaping from its stall crying, “I’m saved! You saved me.” So perhaps it is a bit more troubling at the end of the show when he is wondering if his baptism really took. A pastor’s heart is put on the rack when Arseface tells the Preacher that he lied to him, that he really hadn’t changed. He begins to beg for a do over, maybe we didn’t say the words right. Arseface thought he could hear God again after his baptism, but his struggles with despair have returned. Jesse tells him it is too late, you just have to try harder. It wasn’t that baptism didn’t take or needed to be done over again, nor is it a matter of us having to just try harder. Baptism is much greater than all that—it is a gift to be returned to over and over again. Arseface was right when he jumped for joy proclaiming that he was saved. “Baptism now saves you.” (1 Pet 3:21) This is the sure and certain word of God Himself meant to speak to us in the midst of our trials and struggles. We don’t rebaptize, we return to our one baptism over and over again. This is what it means to live in repentance, to hold fast to His word, His promises. These are glorious words of comfort and joy that crucify the Old Adam and sends the devil in flight. “Do you not know that all of us who have been baptized into Christ Jesus were baptized into his death? We were buried therefore with him by baptism into death, in order that, just as Christ was raised from the dead by the glory of the Father, we too might walk in newness of life.” (Rom 6:3-4) We don’t try harder, we repent by believing in our baptism, returning to it again and again, and living in grace knowing our sins have been buried in Christ’s tomb, and we now live in Him. This happened, not because we wanted it to, but because God wanted it to. This is just as true for Arseface as it is for Tulip, as it is for me, and you, too. Perhaps we didn’t know the details of it when we were baptized. Maybe we got baptized for love or seduction of a boyfriend or girlfriend like Tulip. Maybe you got baptized because of pressure from your parents. Maybe your parents just loved you enough to douse you with grace before you could think. It doesn’t really matter why. The fact is, you have been baptized. God did it, He made baptism, He attached the promise of the Holy Spirit to it. He buried you with His Son so that you, too, could walk in the newness of life.